If you know the name Jonathan Richman, it’s probably because of The Modern Lovers, the band that Richman fronted as a young man. But that was 1972, and Richman’s musical career has spanned the last four decades. Now armed with a nylon-stringed guitar and a flair for the exotic, Richman is known for his almost childlike enthusiasm and free-flowing, improvised live shows. He has amassed a large and loyal following—which will surely be following him to the Goat Farm for his concert tonight. WABE’s Myke Johns sat down with Richman and his drummer Tommy Larkins to talk about his approach to music and his relationship with his audience. 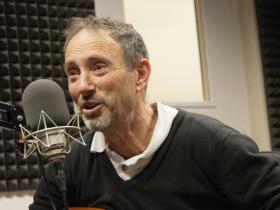 Jonathan Richman and Tommy Larkins will be appearing at the Goat Farm Arts Center Thursday night at 8 p.m.